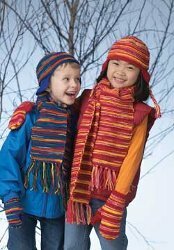 Create a matching hat, scarf and mittens set for your kids using colorful yarns from Patons! They'll be warm and stylish this winter. Hat and Scarf: Size 4 mm (U.S. 6) knitting needles or size needed to obtain tension. Mittens: Set of size 4 mm (U.S. 6) double pointed knitting needles or size needed to obtain tension. Scarf: 6 x 46 ins [15 x 117 cm]. Hat: To fit child 2/4 yrs (6/10 yrs). Mittens: To fit child 2/4 yrs (6/8 yrs - 10 yrs). 22 sts and 28 rows = 4 ins [10 cm] in stocking st.
M1 = make one st by picking up horizontal loop lying before next st and knitting into back of loop. M1P = make one st by picking up horizontal loop lying before next st and purling into back of loop. The instructions are written for smallest size. If changes are necessary for larger size(s) the instructions will be written thus ( ). Numbers for each size are shown in the same color throughout the pattern. When only one number is given in black, it applies to all sizes. With MC work 4 rows. With A work 4 rows. With B work 2 rows. With MC work 2 rows. These 16 rows form Stripe Pat. With MC and pair of needles, cast on 10 sts. 2nd row: P1. M1P. Purl to last st. M1P. P1. 3rd row: K1. M1. Knit to last st. M1. K1. Rep last 2 rows twice more, then 2nd row once. 24 sts. Work 12 rows even in stocking st, ending with RS facing for next row. Break yarn. Leave sts on a spare needle. Work as given for First Ear Flap. Do not break yarn. Body of Hat: (Joining row). With MC, cast on 8 (9) sts. Knit these 8 (9) sts. K24 across Second Ear Flap. Turn. Cast on 35 (39) sts. Turn. K24 across First Ear Flap. Turn. Cast on 8 (9) sts. 99 (105) sts. Last 4 rows form Texture Pat. Beg with 9th row of Stripe Pat, cont in Stripe Pat and rep last 4 rows of Texture Pat 7 times more, dec 2 (0) sts evenly across last row. 97 (105) sts. 1st row: K1. *K2tog. K10 (11). Rep from * to end of row. 89 (97) sts. 3rd row: K1. *K2tog. K9 (10). Rep from * to end of row. 81 (89) sts. 5th row: K1. *K2tog. K8 (9). Rep from * to end of row. 73 (81) sts. Cont in same manner, dec 8 sts on next and every following alt row 5 (6) times more. 25 sts. Next row: K1. *K2tog. Rep from * to end of row. 13 sts. Break yarn leaving a long end. Draw end through rem sts and fasten securely. Sew back seam. Cut A, 15 ins [38 cm] long. Take 12 strands tog, fold in half and knot into fringe at end of each earflap and at top of Hat as shown in picture. Braid each Fringe. Knot securely and trim ends evenly. **With MC and set of four knitting needles, cast on 28 (36-44) sts. Divide sts on 3 needles as follows: 12 (12-16) sts on 1st needle, 8 (12-16) sts on 2nd needle and 8 (12-12) sts on 3rd needle. Join in rnd. Place marker on first st.
Beg with 1st row of Stripe Pat. 1st rnd: *K1. P1. Rep from * around. Rep last rnd of (K1. P1) ribbing for 11/2 (2-2) ins [4 (5-5) cm] and inc 4 sts evenly across last rnd. 32 (40-48) sts. 1st rnd: K16 (20-24). Inc 1 st in each of next 2 sts. Knit to end of rnd. 3rd rnd: K16 (20-24). Inc 1 st in next st. K2. Inc 1 st in next st. Knit to end of rnd. 5th rnd: K16 (20-24). Inc 1 st in next st. K4. Inc 1 st in next st. Knit to end of rnd. 7th rnd: K16 (20-24). Inc 1 st in next st. K6. Inc 1 st in next st. Knit to end of rnd. 9th rnd: K16 (20-24). Inc 1 st in next st. K8. Inc 1 st in next st. Knit to end of rnd. 42 (50-58) sts. 11th rnd: K28 (32-36). Slip last 12 sts onto a safety pin (thumb opening). Knit to end of rnd. 12th rnd: Knit, casting on 2 sts over slipped sts. 32 (40-48) sts. ***Cont in Stripe Pat, knit in rnds until work from beg measures 6 (7-8) ins [15 (18-20.5) cm]. Rearrange sts as follows: 16 (20-24) sts on 1st needle. 8 (10-12) sts on 2nd needle. 8 (10-12) sts on 3rd needle. Shape Top: 1st rnd: 1st needle: Sl1. K1. psso. Knit to last 2 sts. K2tog. 2nd needle: Sl1. K1. psso. Knit to end of needle. 3rd needle: Knit to last 2 sts. K2tog. Dec 4 sts on every rnd, as before, until there are 8 sts. Break yarn, leaving a long end. Thread end through rem 8 sts. Draw up and fasten securely. Thumb: With MC, K12 from safety pin. Pick up and knit 2 sts at base of thumb. Divide these 14 sts onto 3 needles. With MC, knit 9 (11-15) rnds. Next rnd: (K2tog) 7 times. Next rnd: (K2tog) 3 times. K1. Work from ** to ** as given for Right Mitten. 1st rnd: K14 (18-22). Inc 1 st in each of next 2 sts. Knit to end of rnd. 3rd rnd: K14 (18-22). Inc 1 st in next st. K2. Inc 1 st in next st. Knit to end of rnd. 5th rnd: K14 (18-22). Inc 1 st in next st. K4. Inc 1 st in next st. Knit to end of rnd. 7th rnd: K14 (18-22). Inc 1 st in next st. K6. Inc 1 st in next st. Knit to end of rnd. 9th rnd: K14 (18-22). Inc 1 st in next st. K8. Inc 1 st in next st. Knit to end of rnd. 42 (50-58) sts. 11th rnd: K26 (30-34) sts. Slip last 12 sts onto safety pin (thumb opening). Knit to end of rnd. Work from *** to *** as given for Right Mitten. With MC and pair of needles, cast on 33 sts. First 4 rows of Stripe Pat are complete. Keeping cont of Stripe Pat, rep last 4 rows of Texture Pat until work from beg measures 46 ins [117 cm], ending with RS facing for next row. Cast off knitwise. Fringe: Cut A 10 ins [25.5 cm] long. Take 4 strands tog, fold in half and knot into fringe 3/4 inch [2 cm] apart across each end of scarf. Trim fringe evenly. I see where you may be going wrong-at the point that you are slipping the 12 stitches to a holder, you should have 50 stitches on the needles. So, you knit 32 stitches, slip 12 (these 12 are from the 32 that you just knit) and continue with the 18 stitches that are still left to be worked. hope this helps.